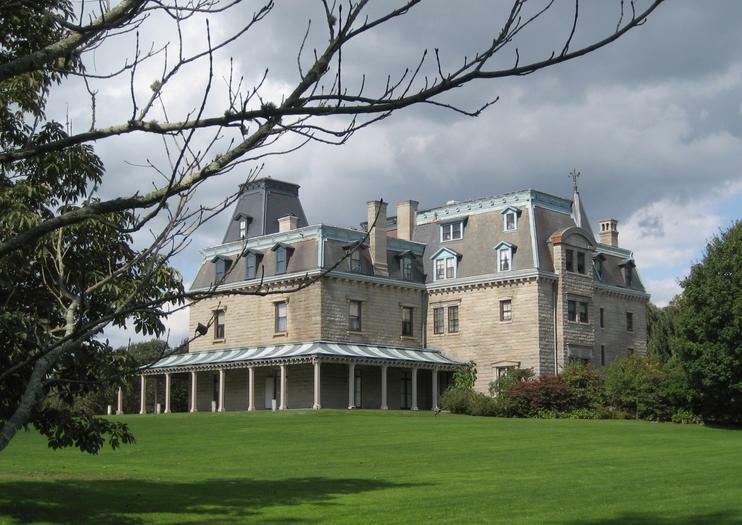 One of the many impressive Newport Mansions, Chateau-sur-Mer calls famous Bellevue Avenue home. Completed in 1852, it had a reputation for its parties, including the "Fete Champetre," an elaborate picnic for more than two thousand guests in 1857, and the 1889 debutante ball for Miss Edith Wetmore. Chateau-sur-Mer was built for China trade merchant William Shepard Wetmore. When Wetmore died ten years later he left the Italianate-style villa and much of his fortune to his son, George Peabody Wetmore. The son, who went on to a distinguished political career as Governor of Rhode Island and as a United States Senator, married in 1869. He and his wife, Edith, spent a stretch of the 1870s on extended trip to Europe. During their travels, architect Richard Morris Hunt remodeled and redecorated the estate in the Second Empire French style. It was then purchased by the Preservation Society of Newport County in 1969 and designated a National Historic Landmark in 2006. The operating schedule at Chateau-sur-Mer varies according to the season. Free off-street parking is available. Children are welcome, but strollers are not permitted inside the mansion.